Original Wallpaper: Shut UP and Lemme Go! Minitokyo »	Original Wallpapers » Original Wallpaper: Shut UP and Lemme Go! It's kinda early but HAPPY BIRTHDAY TO KURYUKI! It is spooky, good work! You've always had such a distinct style. 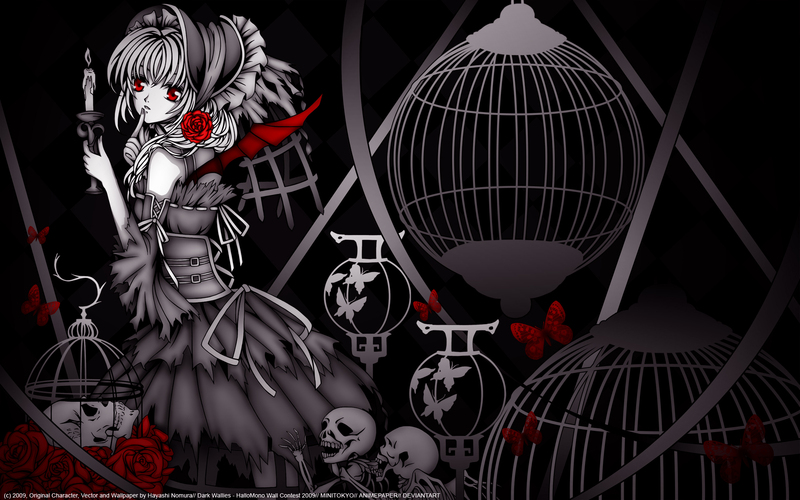 Hmm It's a cool wallpaper thank you,I really love dark colors. Waow. That's so.... Hmm, so great? And awesome, of course. And the Ting Tings song title? This is such a beautiful wall! I really like the darkness and how you used minimalistic coloring. It really emphazises the gothic-ness! but i really do think that its time for you to flex your skills in coloring. i think that the monochrome color scheme and the lighting makes your work look flat--flat is good sometimes but i feel thats not what you are going for so it makes it more uninteresting. try more define edges, figure out where the shadows go and paint them in, rather than just airbrushing your way out of it. torn rags dont look smooth in their shading, they shoudl have some roughness. and shadows dont just surround the edges, they flow into the middle with the creases as well. and sometimes things are highlighted rather than shadowed. i think if you spent more time on shading and coloring you could make really great work esp with your skills as a drawer. Awesome, really love the colors used. The gothic theme will be sure to help...my desktop get into the season...hehe. Thanks for sharing!